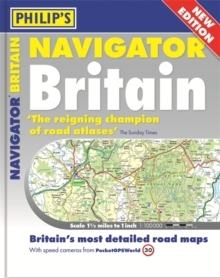 Philip's Navigator Road Atlases - the UK's best-selling Road Atlases. 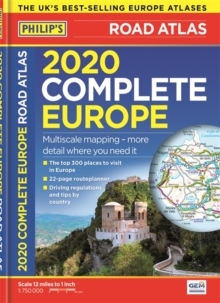 The No.1 Choice of Road Atlas for the serious motorist. No other road atlas of Britain offers this level of detail and clarity. 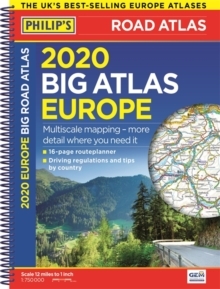 'A map that beats all others' The Daily Telegraph'Scale, accuracy and clarity are without parallel' Driving Magazine'No.1 in the UK for clear maps' Independent research surveyBritain's best road mapping in a great spiral format. Every street in Britain marked on the maps. Over 3000 roads named. Fixed speed-camera locations, with speed limits. 100 indexed town-centre maps plus approaches maps to 12 major urban areas. Super-detailed 6-page route-planning section. Up-to-date mapping at 1.5 miles to 1 inch. Exceptional road detail, from motorways to country lanes, with every junction, roundabout and slip-road shown. Thousands of individually named farms, houses and hamlets. Philip's Navigator Britain shows speed-camera locations, with their speed limits, and provides over 3000 road names as well as numbers. 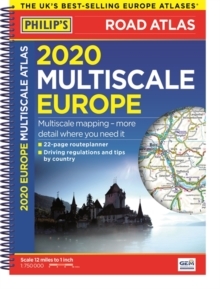 It also includes a massive selection of 100 indexed town-centre maps, detailed approach maps to 12 major urban areas, plus route-planning maps, a distance table, and a fully comprehensive 43,000-name index. The main road maps are at 1.5 miles to 1 inch (Northern Scotland at 3 miles to 1 inch) and are extra clear and detailed, showing even the smallest roads and lanes that are omitted from other atlases. Every roundabout, junction and slip-road is shown in detail on main roads and motorways. In country areas, thousands of individual houses and farms are marked, along with footpaths and tracks. The alpha-numeric grid is based on the National Grid, so that the atlas can be used with GPS systems. In addition, every street in Britain is located on the maps. 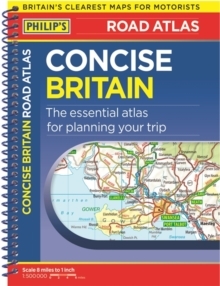 Over 8000 tourist attractions and places of interest are shown and named on the maps, including national parks, nature reserves, RSPB reserves, TWT reserves, houses and gardens, beaches, marinas, canals, county showgrounds, CCC camping and caravan sites, shopping villages, World Heritage Sites, long-distance footpaths, sporting venues, park and rides, and ferries. Available in a Flexi Paperback or a Spiral Paperback binding, Philip's Navigator Britain is widely used by professional drivers and the emergency services, including national police training, and is recommended in the motoring press and national newspapers.